After a long hot gloriously sunshiny day at Calgary Stampede, we met up with friends at Teatro - a restaurant we've been wanting to try for a while with good reviews from some friends, and as we've eaten countless Teatro's desserts at Vendome, so we were definitely looking forward to trying their appetizers and entrees. We made for an interesting table, with half of us in dressy business casual, and the other half initially feeling a little under dressed in our Stampede themed garb, but there was a couple other tables sporting western gear and cowboy hats. The decor had a Venetian feel to it, with tall white columns, pale golden woods, white linens, touches of gold and bronze and a high vaulted ceiling giving it a very spacious, ritzy feel. Sadly, the extremely poor, curt and selective service left a stronger impression than the food. The wine list was quite extensive, requiring a binder for their wine list with bottles ranging from $35-300+. After a sticky hot afternoon, we decided to go with cocktails if our waiter recommended any, as there wasn't any listed in the binder of wines, but he was rather abrupt after we stated our table preferred not to have wine, so we stuck with water instead. Our waiter approached our table and stood in silence while we waited for him to tell us about the night's specials. When he oddly did not, despite overhearing him state the specials to other tables, we shrugged it off and ordered our food. When asked if the duck entree can be made medium rare, our waiter's curt reply of "It is only served medium rare. That's Duck Marget" - raised many eyebrows at our table at his barely civil behavior. 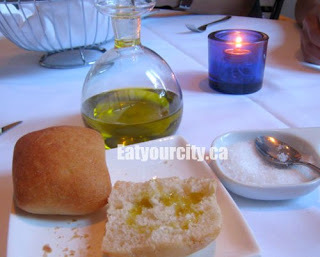 While waiting for our appetizer to come out about 30minutes later, we snacked on some fairly dry and chewy mini focaccia-like bread served with olive oil and some sea salt. 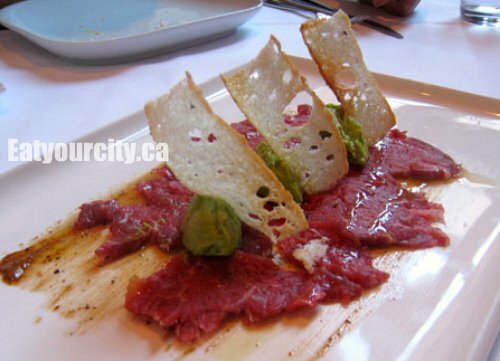 We all have a soft spot for rare Alberta beef, so its no surprise we went with Teatro's beef carpaccio advertised that its topped with chipotle avocado mayonnaise, focaccia lace, and fleur de sel. We were expecting paper-thin slices of tender beef - slightly thicker than what we'd expect at a Japanese place as most Western places don't have as high caliber knife skills, but the nearly 0.5cm thick ragged slices of beef that came out was a bit shocking. It was lying on a thin smear of olive tampenade with a thin drizzle of olive oil and topped with scoop of bland mashed avocado completely lacking in chipotle flavors and a cheese crisp. Thankfully the bowl of sea salt that was provided for the bread wasn't cleared away yet, as we had to season the carpaccio ourselves. There wasn't enough of the tampenade to lend enough salt to the whole unseasoned plate. The carpaccio presentation while pretty, required much more work in its execution. For a place like Teatro, I expected the beef to be sliced evenly and paper thin, with the avocado paste seasoned or have more of the olive tampenade to lend salt and acidity than what the extremely bland and poorly thought out dish that was served. Keeping with the Alberta theme, we hoped we'd have better luck with the Alberta bison tartar served with triple creme brie crostini and an argula salad. The tartare was nicely plated and despite our waiter telling us he'd get us our crostinis, he never did return with them. 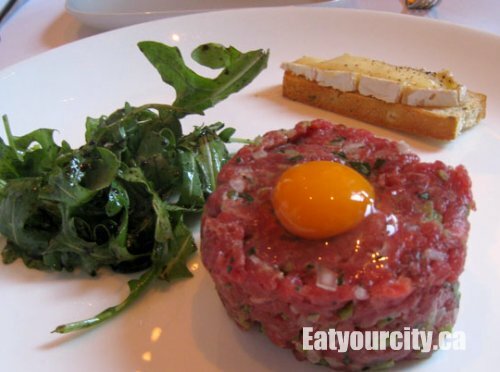 Tartares typically need crostinis, crisp bread or crackers to act as a base to spread the tartare on. We ended up making do with the chewy focaccia like buns as our waiter didn't come back until a good 30min later to check on us. Again, we were very surprised at the poor execution. The tartare was served oddly warm. It was closer to room temperature than the expected cool or cold. It was obvious the meat only went through the grinder once... or a very poor grinder as we had several large stringy globs of meat chunks throughout the tartare instead of a finely diced or ground meat. The tartare was flavored with diced onions, mint and a strong hit of pepper which tended to mask the subtle sweetness inherent in bison. The quail egg used to top it was luke warm and inexpertly served with the entire egg white rather than just the yolk. The gelatinous warm egg white was unappetizing and difficult to remove from the tartare. The only saving grace was the simple arugula salad of arugula leaves tossed in a syrupy reduced balsamic vinegar. Some found the dressing a bit too sweet while others enjoyed it. 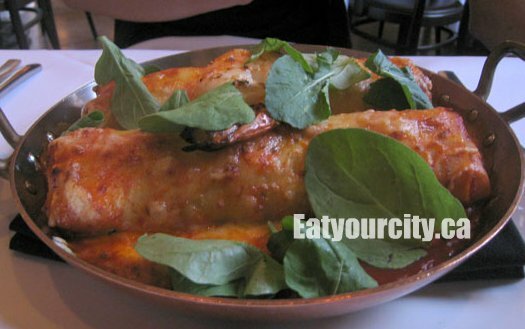 Small chunks of lobster, shrimp, scallops and marscapone cream is stuffed into two large pasta tubes and doused liberally with a creamy lobster bisque and topped with some Parmesan and spinach greens. This Italian favorite is executed well, though the cream inside the pasta tubes while giving a nice sweetness, gives the pasta a bit of a pasty mealy mouthfeel. However, the intense flavor imparted by all the seafood carry though this dish well. You really can't go wrong with lobster, pasta and cheese. 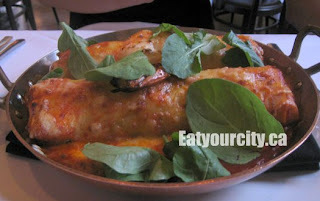 Our fellow foodie enjoyed her canneloni, though her suggestion to Teatro was to serve a partial portion as it would be difficult for anyone to finish off the dish which was as big as a large set of binoculars, and still have room for appetizers and dessert. The duck breast was cooked to a marvelous medium rare and piled atop of verde polenta (a bright green sweet pea and salty polenta), caramelized cippolini (Italian onions) and a sauteed fig paste. The duck breast had a nice color though did not taste of the rosemary and honey it was supposed to be seared with, and cut with the grain - a big nono as the resulting thinly sliced duck was chewy rather than tender. The lack of salt in the beef carpaccio was more than made up here as the duck jus, caramelized onions, fig paste and verde polenta while savory was intensely salty salty salty. The plate came with a grilled chop, leg, sausage and served with gnocchi and a salad. 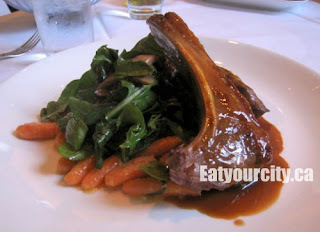 The lamb chop was a bit too gamey to be spring or young lamb and cooked to a disappointing medium-well. The waiter never gave me a chance to ask for it to be made medium-rare, so it was a bit on the dry and chewy side. The lamb "leg" turned out to be a small 3oz piece of lamb, again cooked to a medium-well (and I'm being generous - it was mainly grey with a faint blush of pink). The sausage was a small super gamey ground lamb with cumin and lots of pepper that didn't mask the very strong gamey flavor. We jokingly proclaimed the sausage was made with a very senior geriatric lamb. The sundried tomato gnocchi was tender bouncy and executed well, pairing well with the rosemary flavored lamb jus. A few roasted portabello slices didn't pair well with the arugula salad, which was again laced with a syrupy sugary balsamic vinegar reduction. the DESSERT A bit offput from the service, and disappointed with the poor showing of food both execution and flavorwise, we all agreed to skip dessert. Overall, the food fell far far far short of our expectations. Overseasoning (Duck Marget), under/non-existent seasoning (beef carpaccio), service at wrong temperature (warm bison tartare.. ick) were amongst the largest poor execution errors of the night. The long wait times of food service was a little odd as well - we waited about 30min for our appetizers to arrive, and close to an hour after the appetizers for our entrees... so for just appetizers and mains, it took over 1.5hours for all the food to appear on the table. Normally, a longer meal with friends doesn't bother me, but the food service didn't flow, and instead of having appetizers given after each one is finished, there was an extended wait inbetween courses, and some of us were planning to head back to catch the Grandstand show. We could honestly say it was the worst service we've had the misfortune to experience... everyone in our group are young professionals, and we were all extremely disappointed with the service provided by our older raven haired Caucasian waiter. We initially cut him some slack as we thought he was the only waiter, but we soon caught sight of 2 other waiters (one blonde and one Asian) as well as a waitress who cleaned tables and filled out water glasses. But when his dismissive and barely civil attitude that rode towards the edge of outright rude in his rare appearances, we all shook our heads at his unprofessionalism. We also took note that our waiter gave selective service to tables. 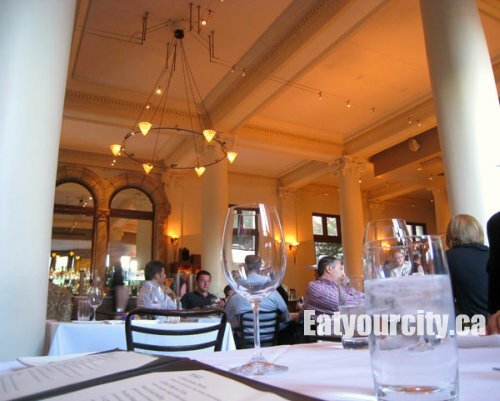 There were a few other tables that received the same treatment as ours - the befuddled and irritated looks on the patrons faces amusingly in a sad way, mirrored our own. There were a few tables where we could overhear him effusively telling the patrons information about a certain vintage, extolling the specials of the night, offering a plastic storage stand for ladies purses, scraping crumbs off the table between courses and what ingredients and flavors they should expect in their food when it arrived. We relied on our tastebuds and our own knowledge as our food arrived with only the announcement of its name, our table remained decorated with crumbs throughout the night, and our purses remained scrunched in our chairs. The cleaning girl was friendly, refilled our glasses with smiles... and the only reason the service isn't meted a negative number. The poorly executed food and awful service is warranted more for a quick exit out the door than a pleasant dining experience. The warm temperatures the carpaccio and bison tartare were served at was probably the reason why one guest immediately became violently ill at the restaurant (the bathroom is poorly situated in the basement of the restaurant), one guest became very ill shortly after the meal, and one became ill through till the next afternoon. One time is bad luck, two is coincidence, but three? A physician friend was very tempted to report the restaurant, but we decided not to as the kitchen may have just had a very bad night. I know many of us won't ever be convinced to go back. One of my foodies (one of the few that didn't get sick from the meal) will give it one more chance in a few weeks incognito with a promise that she'll avoid the waiter we had tonight to see if it was just plain bad luck we had a bad kitchen day and a waiter who had his nose stuck up in the air far more often than he checked on his assigned tables. I wish her a much more pleasant gastronomical experience... in more ways than one. Oh, and our waiter only packed up half of the meals that our table requested (placed in a nice take away fabric bag) with the other half forgotten... in retrospect, perhaps that was for the best. Well what else can I add. It's disappointing that the waiter gave us poor service because we didn't order drinks. I've had better service at the snooty Eleven Madison Park in nyc, but I guess it comes with the territory when you play on that level (which this place isn't). 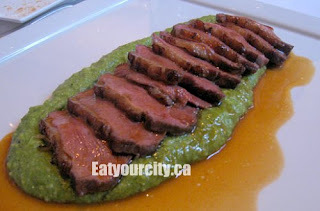 The duck was okay, but I'd prefer something different then the bed of polenta. All and all, the best part of the night was spending time with good friends. Made the slow and poor service bearable. Do you own the vin room?????????? Nope, we do not own the vin room. The closest thing to a "vin room" the Eatyourcity.ca team has is our personal wine cellars LOL. We dined there last night and had the unfortunate experience of suffering through the service of the same waiter... what a piece of work he is! The food was ok (I had the duck) but not anything I would rush back for. Because of the service we received, we won't be darkening their doorway again anytime soon. I'm a little relieved to see that it wasn't just us, yet disappointed that a restaurant like Teatro with a seemingly good reputation would continue to employ someone who is so off-putting to their clientelle. Too bad. Sorry "foodie", what's a tampenade? must be that you are ***** trash???? We censored the above comment for racial slander. These types of comments does both you and the restaurant a disservice. A few Girlfriends and myself tried Teatro this past Thursday. The the service was unbelievably slow. Although I did not take a watch to time it, the appetizers took easily a half hour. One would expect the main course to follow shortly after the completion of the appetizers, but again we waited and waited. We opted for dessert. It was fabulous! but again we waited. In total we were there THREE HOURS! It was not as though we were doddling. By the time we completed the desserts we were ready to go! I am not clear whether it is the fault of the Chef or the waiter, but I will never go there again nor would I recommend it to others. When you are paying close to $100.00 per person, you would expect better!